This Chrome wheel and tire cleaner kit includes Lane's Black & White Tire Cleaner, a heavy duty bleach tire, white lettering and white wall cleaner that attacks dirt and grime on the tire. 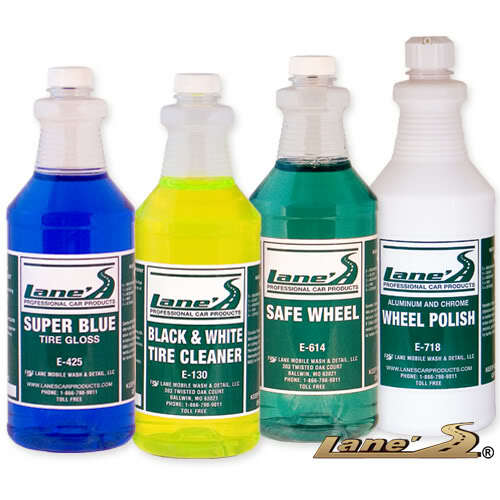 Lane's Safe Wheel is a non-acidic wheel cleaner that is designed to clean and brighten even the dirtiest chrome wheels effectively and safely. For the finishing touch to your tires, Lane's Super Blue Tire Shine is a high gloss, fast drying, long lasting solvent based tire shine. Super Blue is a concentrated tire shine that will repel water and add that extra protection to your tires. Finally, in this great chrome wheel and tire cleaner kit we include Lane's Wheel Polish, which removes corrosion, oxidation, stains, rust, tarnish and water spots while restoring metals to original chrome brilliance. Polishing your chrome wheels allows wax and natural oils to seal in a deep shine with long term protection.